Though entering the dangerous waters around the British Isles, passengers onboard the luxury liner RMS Lusitania took comfort in the fact that were onboard a unarmed passenger vessel. Sadly, the reality of the European war came in the form of a German torpedo that sank the Lusitania on May 7, 1915. Close to 1,200 people died, including 128 Americans. The Lusitania’s construction and operation was subsidized by the British government and while she was a passenger vessel, she also carried war supplies across the Atlantic. In February 1915, the German government had declared the seas around the British Isles a war zone and warned commercial and neutral ships that they entered at their peril because of this transport. Britain promised the Lusitania that it would be protected by destroyers but did not actually provide escorts. Because she wanted the U.S. to enter the war on her side, Britain used the disaster to step up her appeal for U.S. help in the public media. Thus, the sinking deepened a broad debate on the meaning of U.S neutrality. While America did not enter the war until two years later, the sinking of the Lusitania was one step down the road toward United States’ entry into the conflict. Connecticut was deeply impacted by the tragedy. State residents were among the lost and among those who survived. Well known architect Theodate Pope of Farmington was aboard. Miss Pope survived the sinking, while the “psychical research” magazine editor Edwin W. Friend, also of Farmington, went down with the ship. Lesser known people, such as Patrick McLoughlin, a native Irishman living in Hartford, made it off the doomed Cunard Line vessel. The full list of Connecticut residents involved appears in the newspapers. At the center of much national controversy was the cargo of munitions that the Bridgeport Evening Farmer claimed hailed from this Connecticut city. Hartford insurance giants, including Aetna and Travelers, suffered major losses from the wreck. Incredibly, though state residents were lost, public opinion was sharply divided over the sinking, with some remaining cautious about U.S. involvement in the European war and others eager to get the U.S. directly into the fray. Editorials from both Democratic and Republican party newspapers allow the researcher to follow these public discussions from the opening of the European conflict to the moment the U.S. declared war. In addition, the Connecticut newspapers in Chronicling America published the accounts of local survivors such as James H. Brooks of Bridgeport and Mrs. Elizabeth Duckworth of Taftville. These accounts contributed to the unfolding national narrative surrounding the tragedy, and include their stories of safety measures ignored and self-sacrifice displayed. September 5th, 1914. British cruiser HMS Pathfinder is torpedoed and sunk with heavy loss of life by U-21. It is the first warship sunk during the conflict by an enemy submarine. February 4th, 1915. Germany announces unrestricted submarine warfare. The campaign would allow U-boats to strike enemy vessels without warning; neutral vessels could also be targeted. April 22, 1915. Imperial German government sends its embassy in the United States a warning that vessels sailing under the British flag or its allies is subject to attack. This warning is not circulated in the newspapers until May 1st. May 1st, 1915. Lusitania sails from the harbor of New York City bound for Liverpool, England. It will be the final crossing for the Cunard liner. Connecticut cargo and residents are onboard her. May 7th, 1915. German U-20 torpedoes and sinks Lusitania off the Old Head of Kinsale, Ireland. Close to 1,200 passengers and crew go down with the ship that sinks in 18 minutes. Word of the sinking first reaches Connecticut’s ears before the end of the day, as the Bridgeport Evening Farmer reports in its issue. May 8th, 1915. The Hartford Courant first reports on the loss of the British vessel, noting residents of the capital city were aboard her. The Bridgeport Evening Farmer reports the ships was carrying munitions; which will later be a source of controversy. May 14, 1915. 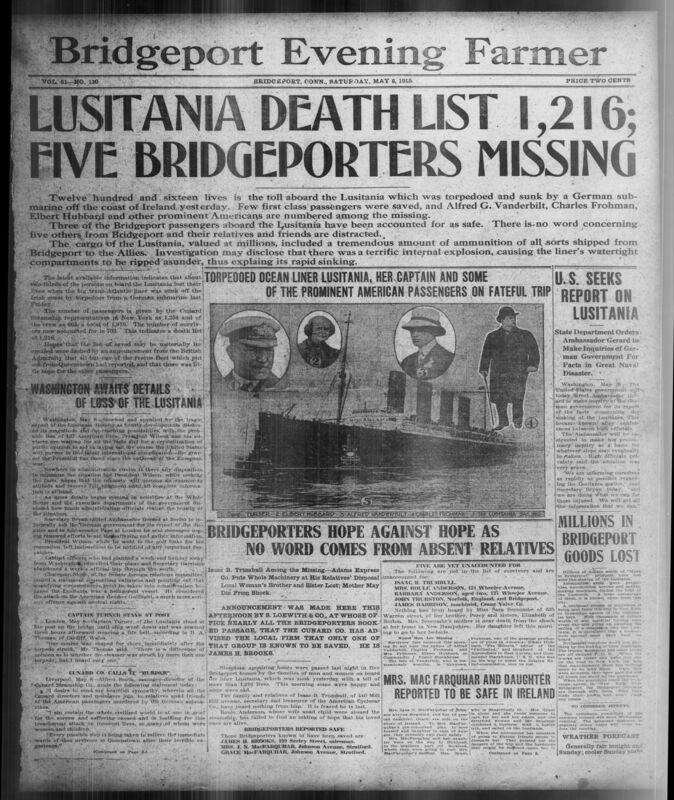 The Hartford Courant notes insurance losses from the Lusitania tied to the state. September 18, 1915. Imperial German government halts it’s “Sink on Sight” policy in order to calm the United States. January 31st, 1917. Imperial Germany announces that it will resume unrestricted submarine warfare. Using the search pages in Chronicling America, try the following terms in combination, or proximity with “Lusitania. Or as part of phrases that include “Lusitania.” To begin, select the tab named “Advanced Search.” Using the dropdown menu on the far left, choose the state “Connecticut.” Then proceed to try the strategies described above. Ford, Nancy Gentile. The Great War and America: Civil-Military Relations during World War I. Westport, Connecticut: Praeger Security International, 2008. Halpern, Paul G. A Naval History of World War I. Annapolis, Maryland: Naval Institute Press, 1994. Hough, Richard. The Great War at Sea: 1914-1918. New York: Oxford University Press, 1983. Trout, Steven. On the Battlefield of Memory: The First World War and American Remembrance, 1919-1941. Tuscaloosa, Alabama: University of Alabama Press, 2010. Zeigler, Robert H. America’s Great War: World War One and the American Experience. Lanham, Maryland: Rowman & Littlefield Publishers.